Pressure cookers are always a bliss to all working people and non working people with small kids as they finish the work in jiffy. Of course we have the INSTANT POT available in market which does the work even faster but we are not debating about it now. 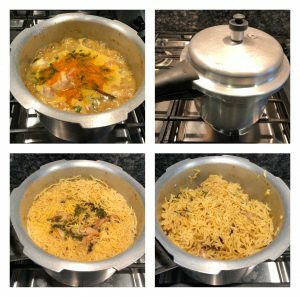 Pressure cooker chicken biryani is one such easy and quick to make biryani recipe that takes anytime around 25 to 30 minutes to cook unlike the electric rice cooker. 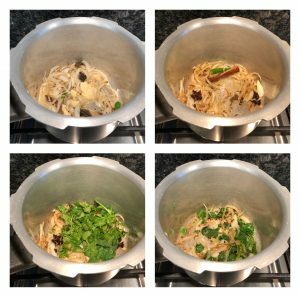 This biryani flavors and taste is not comparable to the biryani prepared in dum style but of course it will yield a quick delicious chicken biryani as this method requires no marination. 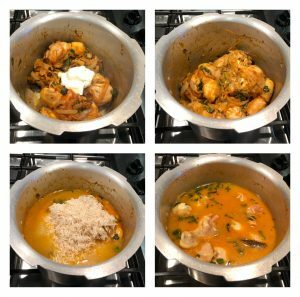 But if you have enough time marinating chicken with salt, turmeric powder, curd and chilli powder will help chicken cook juicy and loads with flavors. 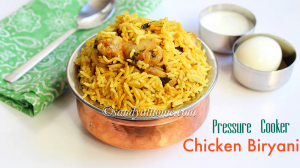 The ingredients used in this recipe are those that we usually use while making biryani, since I got a request long back to post a simple chicken biryani recipe using pressure cooker that yields perfect rice I thought to post it today. Its obvious that we all don’t want our biryani to be sticky one right? Proper water measurement, whistles and flame range decides the outcome of perfectly cooked long rice. So for that I have mentioned everything possible I can in each step which I hope will be useful for many. 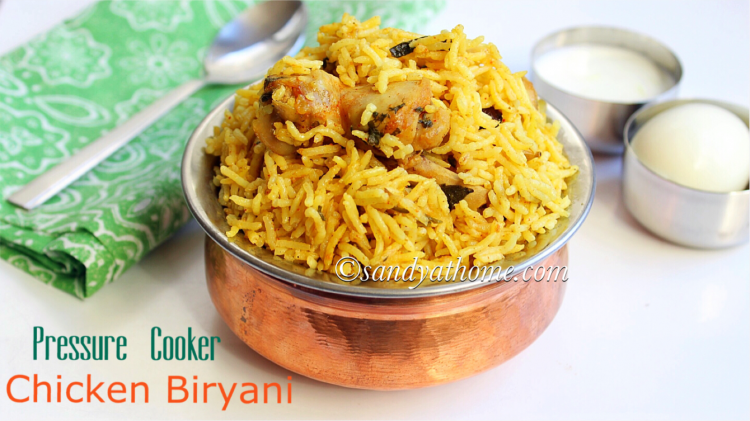 On the whole if you are looking for some quick biryani recipe to be cooked this sunday this shall do the job. So lets get to the making! Wash chicken and keep it aside. Slice onions thin and make slit in green chilli. 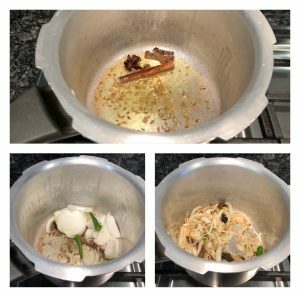 Heat oil and ghee in pressure cooker, add cumin seeds, fennel seeds, bay leaf, clove, cinnamon stick and cardamom. When aromatic add sliced onion and green chilli. Saute well and add ginger garlic paste. Saute well until the raw smell goes. Now add chopped mint and cilantro. Saute well. 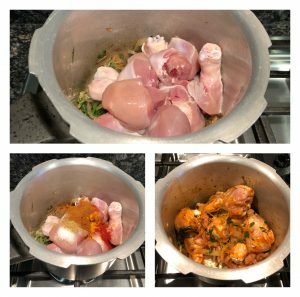 Now add the chicken pieces, salt, turmeric powder, red chilli powder, coriander powder and garam masala powder. 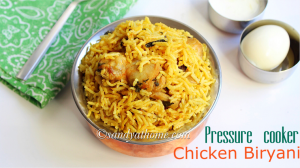 Mix well and cook the chicken for a minute so that they get coated well in masala. 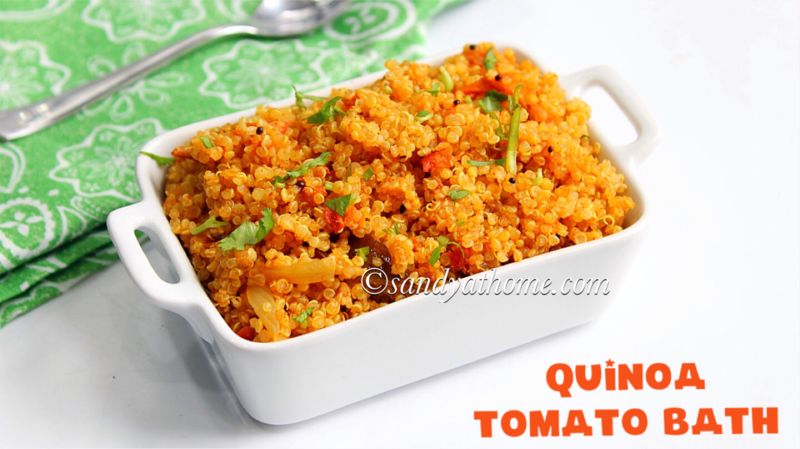 Now add curd to it and mix well. Finally add soaked rice and water. Mix everything well and check for salt. Now allow the mixture to boil well. When the mixture has started to boil close it and pressure cook for 2 whistles in medium flame. When the pressure has subsided allow it to rest for 5 more minutes. Now open the cooker. When the rice looks done take it from the sides using spatula and fluff it gently. Serve it hot with raita! Wash and soak rice in water for 20 minutes. Wash chicken and keep it aside. Slice onions thin and make slit in green chilli. Heat oil and ghee in pressure cooker, add cumin seeds, fennel seeds, bay leaf, clove, cinnamon stick and cardamom. When aromatic add sliced onion and green chilli. Saute well. When the onions look sauteed add ginger garlic paste. Saute well until the raw smell goes. Keep the flame in low to medium from this point as the ginger garlic paste can get burnt easily. Now add chopped coriander and mint. Saute until they shrink in size. Now add curd to it and mix well. After a minute add soaked rice and water. (By now my chicken was little cooked so I used 2 cups of water for 2 cups of basmati rice. Also my rice was soaked for 20 minutes so I dint require extra water, if your soaking time was less or chicken is raw add some more water) Mix everything well and check for salt. Now allow the mixture to boil well. When the mixture has started to boil close it and pressure cook for 2 whistles in medium flame. When the pressure has subsided allow it to rest for 5 more minutes. Now open the cooker. 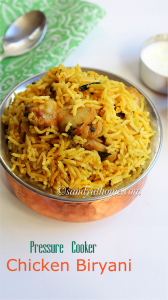 When the rice looks done take it from the sides using spatula and fluff it gently. 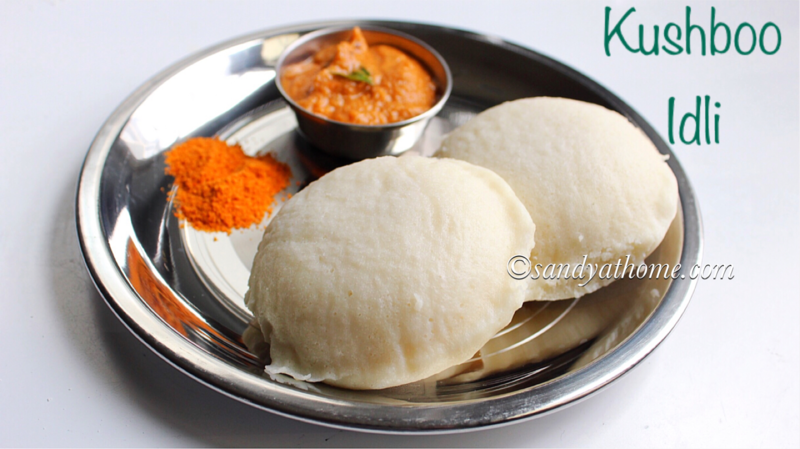 Serve it hot with raita!